Docker has drastically enhanced how we develop and deploy web applications. With docker, we can isolate our development environment and resemble the production environment as close as possible. When our development environment resembles the production environment, we deploy with confidence. We can even go a step further. With automated tests, and few other tools, we can automate the deployment. That brings ease and confidence — for us, for our teams, and for our clients. In software development, ease and confidence is value. 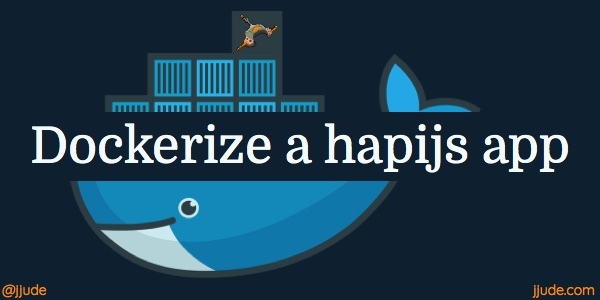 In this tutorial, I’m going to show you how to dockerize an existing hapijs application. Hapijs is a nodejs framework from Walmart. They use it to power their e-commerce system. If you require an introduction to hapijs, you can read my introductory post about hapijs. First, we are going to create a simple hapijs application. To do that let us create the package.json file. This is a common package.json file. I want you to notice just two lines here. We are using a start script: node src/server.js. It will become clear as we go along. Just keep this in mind. Also, notice that we are using hapijs version 14. Now let us create the server.js file. Nothing special here. We instantiate a Hapi server at port 8080 and print Hello docker when the server comes up. We can pull an existing nodejs docker container and build our application on top of it. Or, we can build a container from scratch. We are going to build it from scratch. We are going to use alpine as the base OS for our container. Why alpine? Alpine is both small and secure. We are going to create a text file named Dockerfile in the same directory where we created the above two files. Dockerfile contains the instructions to build the container. If we build a container with these lines, we will get a nodejs container. We want a hapijs one. So let us go on. Remember, we already created a package.json and server.js files. Let us copy them into the container. Append these lines to Dockerfile. Let me explain these lines. Line 1: We are instructing the docker engine to copy the entire directory to a folder src within the docker container. Line 2: Install the required dependencies. This will install hapijs. Line 3: Notice that in the server.js we are running the hapijs server at 8080. In this line we instruct docker to expose 8080 port to the outside world, so that we can access the server from our host machine. Line 4: Lastly we instruct docker to run the server with the command node /src/server.js. Commands and parameters are given in the fashion as in this line. docker build -t jjude/hapi . Docker needs a dockerfile to build a container. We can either provide the full path or instruct to use the dockerfile in the current directory. We are instructing the build process to use the Dockerfile from the current directory. It is also a good practice to tag the container with <user_name>/<application_name>.